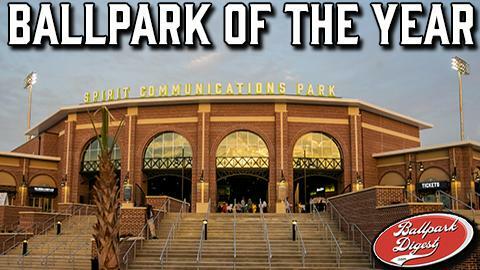 COLUMBIA, SC - Ballpark Digest honored Spirit Communications Park as its 2016 Ballpark of the Year on Tuesday. The home of the Columbia Fireflies - the New York Mets' South Atlantic League affiliate - was selected as the top park across Minor League Baseball nationally for 2016. Representatives from Ballpark Digest will be on hand for Columbia's home game against the Greensboro Grasshoppers on Thursday, August 11, to present the award to the Fireflies and representatives from the city of Columbia and the ballpark development team. To commemorate this honor for Spirit Communications Park, the Fireflies will hold a special pre-game ceremony, and will distribute commemorative posters to the first 2,500 fans in attendance at the August 11th ballgame. This full-sized poster will be suitable for framing. "Spirit Communications Park is not only our Ballpark of the Year, it's also one of the best ballparks opened in the last decade," said Ballpark Digest Publisher Kevin Reichard. "The ballpark is the centerpiece of serious economic development in Columbia, and an already-great fan experience should only improve once the BullStreet development advances." Groundbreaking for Spirit Communications Park was on January 6, 2015, and the multi-use park hosted its first baseball game on April 14, 2016 in front of a sellout crowd of 9,077. On July 5 - a day after welcoming a record 9,228 fans into the park for Independence Day baseball - Spirit Communications Park broke the single-season attendance record for any professional baseball team in Columbia's storied history. To date, 181,673 fans have passed through the park's gates for Fireflies games; an additional 10,000+ people have also attended community and private events at the ballpark. "We are thrilled to receive this recognition from one of the leading publications in our industry, Ballpark Digest," said Jason Freier, managing owner of the Fireflies. "Spirit Communications Park is a beautiful facility, provides an experience that is second to none and has become a true gathering place for the citizens of Columbia. We look forward to decades of affordable family friendly entertainment and building on the relationship with our fans and our community." "We'd also like to take this opportunity to thank our great partners-our builders, CCEB Venture Partners; Populous, the lead designer for the ballpark; Spirit Communications, our naming rights partner; Hughes Development; and, of course, the city of Columbia," added Freier. Spirit Communications Park is home to much more than just baseball. In the few short months since its opening, the state of the art facility has hosted church and community gatherings, business meetings, charity events and festivals. On October 22, Spirit Communications Park will host the Palmetto Health Foundation's Walk for Life and Famously Hot Pink Half Marathon, 5K and 10K - expected to have upwards of 10,000 participants. It will also play host to numerous concerts, high school and college baseball, football and soccer games. "We are honored that Spirit Communications Park was selected for this tremendous distinction," said Team President John Katz. "We're delighted to share this award with our wonderful community who make the atmosphere at Spirit Communications Park one of the best in all of Minor League Baseball. With the imminent growth of the Commons at BullStreet, the ballpark will continue to be a true entertainment destination for our community and for out-of-town guests." "This is classic, family-friendly entertainment," said Columbia Mayor Steve Benjamin about the park. "To see the people of Columbia respond so overwhelmingly to this is phenomenal for our great city. I've seen firsthand the sheer delight on people's faces as they enter the park and realize this is their stadium, this is their park." "Spirit Communications Park perfectly exemplifies what we are creating at BullStreet: a world-class experience for all of Columbia to enjoy," said Bob Hughes, CEO of Hughes Development. "This prestigious award is the latest indication that we are well on our way. Once completed, Spirit Communications Park will be in the heart of a new district that welcomes people from all walks of life to enjoy the best of South Carolina. We are ahead of our 20-year build-out schedule and are excited about what's next." "Spirit Communications is proud to have our name on this magnificent ballpark," said Bob Keane, President and CEO of Spirit Communications. "The collaborative efforts showed a real focus on teamwork, which allows us to be one of the most technologically-advanced ballparks in the country." The Columbia Fireflies are the South Atlantic League affiliate of the New York Mets. The Fireflies play games across the southeast and mid-Atlantic regions, including against in-state rivals in Charleston and Greenville. The team has partnered with the City of Columbia and Hughes Development to construct Spirit Communications Park, a multi-use outdoor sports and entertainment venue at the center of the BullStreet development. The Columbia Fireflies are owned by Hardball Capital, owners of the Fort Wayne TinCaps of the Midwest League and the Chattanooga Lookouts of the Southern League. For more information, visit www.ColumbiaFireflies.com, or follow the Fireflies on Twitter (@ColaFireflies), Facebook (facebook.com/columbiafireflies) and all popular social media platforms.